When working with large power transformers, attention to small detail is very important. 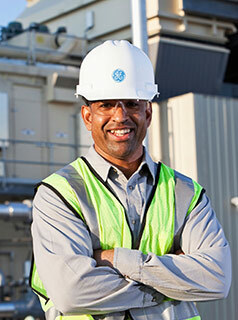 GE’s service teams provide specialized technical services covering the complete life cycle of power transformers. The power transformers services team undertakes extensive on-site investigations and repairs when required, and works to modernize more mature transformers by replacing key components with modern equivalents. The team also performs asset maintenance surveys, which make a significant contribution towards increasing productivity. Failures can be prevented by non-intrusive visual inspections to determine equipment condition. Especially suitable for substations which require particular attention and have no local personnel on site, such as oil & gas platforms, offshore rigs, power plants, etc.